Just off the coast of TABING, Indonesia at [0°54'28.4"S 100°20'01.9"E], what is that disc vibrating under the under the water with the waves coming AWAY from it? The UFO that pulled MH370 down maybe? 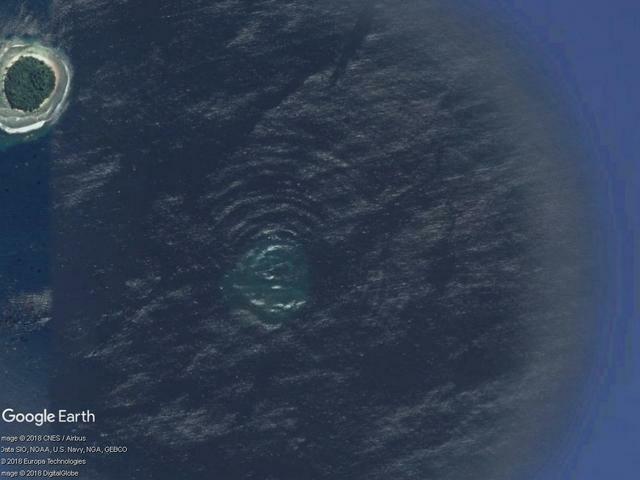 Or an underwater volcano with a perfectly regular eruption pattern?. Can someone measure the wave heights to determine the frequency of the vibration? What the heck is that?!? Welcome to the forum, theshopfittersdotca ! This will be an underwater reef, I think (check the timeslider). The incoming waves create a concentric circle pattern. Can be seen in many places (see example, but less intense).